Selling your home can be an incredibly stressful experience. Your house has borne witness to your family’s laughter and its sorrow. Even if you acknowledge the fact that it is time to move — whether because of an imminent relocation or because your family’s needs have changed — it will be difficult to say goodbye. Then there’s the financial aspect of selling your home. After all, you want its value to be appreciated, and you certainly want to recoup any investments you’ve made in terms of renovations, upgrades, or additions. One of the best possible ways to increase the chances your home will sell for your asking price? Staging your home helps potential buyers picture themselves living in the home. 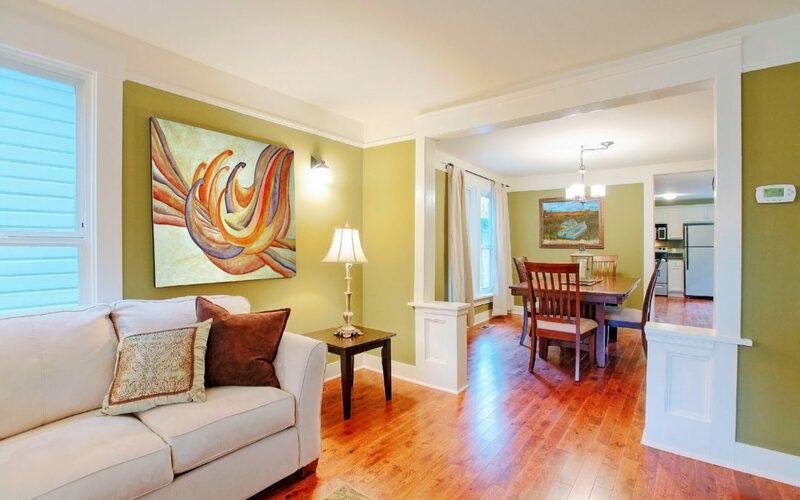 If it’s done right, staging also helps buyers fall in love. Staged homes not only command a higher price, but they sell 73% faster than non-staged properties! Read on to learn five insider tips that will help you stage your home, sell it faster, and put as much money as possible back in your pocket. While it makes good sense to stage any property that you put on the market, there are specific considerations to take into account for luxury properties. Let’s take a look. The first rule of luxury home staging is the same as for all houses, at any price point. In order for potential buyers to imagine themselves living there, the decor and furnishings used during the staging process should be neutral and inoffensive. You will need to remove any personal touches. Family photographs, any heirloom furniture that doesn’t fit into the overall decor, and quirky tchotchkes should all be packed away. In other words, you should remove the details that make your house a home. Repaint any brightly hued rooms with a neutral shade. Scale back artwork, decorations, and even furniture. Aim for contemporary elegance — such as you might find in an upscale hotel chain. Experts caution against stage for sale approaches that are too sterile, however. A few pops of color — think throw pillows, centerpieces, glassware, textiles, or wall art — can go a long way. They provide visual interest without being too personal. And in the luxury home market, you can take greater risks with the decor. A blend of modern and antique furnishings can be immensely appealing. There’s a fine line between neutral and boring. While buyers should be able to picture themselves living in your home, they don’t necessarily want to live in a cookie-cutter property. This is especially true in the luxury home market. Buyers shopping for a high-end residence will want to feel that they are getting something extra special for their money. Highlight stunning architectural details with furniture groupings and strategic lighting. Pay extra attention to any luxury living spaces that aren’t typically included in lower-end homes, such as a wine cellar, home theatre, home gym or yoga studio, outdoor kitchen, or guest suite. Lighting fixtures, kitchen and bathroom cabinets, hardware, and flooring all play more of a role than you might think. Take a walk through your home while imagining you’ve never been inside it before. What do you see? Even a seemingly small upgrade — trading out your old, generic door knobs for sleek European-style handles, for example — can contribute to the overall ambiance that you are trying to create. Sophisticated and luxurious touches should be apparent everywhere. Drape a cashmere throw across the back of the sofa, or spring for top-notch down pillows and comforters on the bed. Luxury textiles and tasteful objets d’art send a subtle but important message. Particularly when it comes to high-end properties, when you sell a house, you aren’t simply selling a residence. Rather, the home represents a lifestyle — and that can be reflected in the furnishings and decor. Think about the prospective buyers you wish to attract. Yes, they are wealthy but consider the image they want to inhabit and present to the world around them. Are they looking for the latest in smart home technology? Or would they rather surround themselves with priceless antiques and one-of-a-kind items? How important is entertaining to them, and what activities do they enjoy? Are they cosmopolitan patrons of the arts, jet-setters, or workaholics? Are they retiring after a long and successful career, or are they just starting to build their family? 5. What About Home Improvements? Is it worthwhile to make improvements, or to replace appliances, solely for the purpose of trying to drive the selling price higher? That depends on many factors, and it’s definitely something you will want to discuss with your real estate agent. It doesn’t make a lot of sense to install a wood-fired pizza oven in your outdoor kitchen just before you sell, but if your appliances are on the older side, or the floors have seen better days, you may want to bite the bullet and spring for some renovations. Some luxury home buyers won’t look at aspects like appliances at all, since they may have plans to replace everything according to their preferences anyway. Others want to be able to move right in, and not have to change a thing. So finding a middle ground when deciding whether to upgrade is usually a smart approach. Remember, too, that relatively inexpensive changes — fresh interior paint or new carpet — can really boost buyers’ first impressions. Have you ever hired a professional home stager? What do you think about these stage for sale techniques? We’d love to hear all about your experiences in selling (or buying!) a luxury home, so please share your thoughts in the comments!